According to the manufacturer, Natural Dynamix Joint DX is aimed at people with aching joints, who want more support for the connective tissue and for enhancing the body’s natural response to inflammation. As people age, their joints start losing their flexibility, and pains can appear, making it close to impossible to move around and do daily chores as they used to. Natural Dynamix Joint DX is made of important ingredients that sustain the natural joint function, by improving and repairing the connective tissue between bones. Since the formula for this product looks quite impressive, we decided to review it for your information. What Does Natural Dynamix Joint DX Contain? We are glad to see so many potent ingredients in the same formula. Natural Dynamix Joint DX includes glucosamine, chondroitin, MSM, hyaluronic acid, which are all key ingredients for joint health. Even more, they work in great synergy together, which is why they must be taken in the same time for the best results. The presence of ginger root powder is also a plus, since this herbal remedy has been used for years as a traditional treatment for aching joints. The recommended dosage for Natural Dynamix Joint DX is two pills daily. A bottle of Natural Dynamix Joint DX with 60 capsules is priced at 24.99USD, and it lasts for one month. The company offers 30 days money back guarantee, if you return the unused portion of the product. Natural Dynamix Joint DX looks like a well rounded, effective formula for promoting healthy joints and improving the quality of the connective tissue. It has all the right ingredients, such as glucosamine, chondroitin, MSM and hyaluronic acid, and it also adds herbal remedies to the mix. 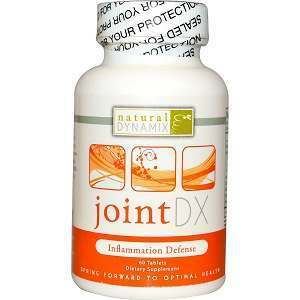 Reasonably priced and with a money back guarantee policy attached, Natural Dynamix Joint DX is a good recommendation. Mark Stevens	reviewed Natural Dynamix Joint DX	on January 10th	 and gave it a rating of 2.